The Force India Formula One team will retain Giancarlo Fisichella, Adrian Sutil and test driver Vitantonio Liuzzi for next season. The drivers' places had been in doubt after the team signed a new technical link-up with McLaren but team owner Vijay Mallya confirmed they would stay. "We have a wonderful balance between experience and ambition and now complete consistency," said Mallya. "I firmly believe that next year will be a huge opportunity for the team." 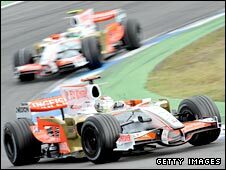 Force India failed to score a point in 2008 but hopes are high for next year after a deal was rubberstamped for them to use the same engines, gearbox and hydraulics as McLaren-Mercedes. They will also share their kinetic energy recovery system (Kers) - a system that converts energy generated under braking into power that can be used for acceleration and which is new to F1 for 2009. Mallya, a billionaire businessman who runs an airline and also has a franchise in the Indian Premier League Twenty20 cricket tournament, said earlier this week that he expected his team to progress from their back of the grid slot in 2009. "I certainly hope to be in the upper midfield in 2009, given all that we are doing, and I'd be disappointed if we are not - so that is a major step forward to begin with," he said. Mallya has also launched a driver search programme to try to find an Indian F1 driver. He revealed: "I was joking with my friends and I said with a population of 1.2bn there must be a Lewis Hamilton somewhere. "Clearly it is at least a five-year programme but we are launching it from 2009 and hopefully we will find the driver we are looking for." And he said interest in the sport was growing in India ahead of the projected F1 Grand Prix in Delhi in 2011. "It is more than just sport in general and the forthcoming Indian Grand Prix," commented Mallya. "It is to do with the young Indian who wants to follow F1, who loves the glamour and competitive spirit of F1. "In India, cricket is a religion, it is for everybody, but you do have that class of upwardly mobile, aspirational Indians who think F1 is for them. "So the popularity of F1, especially after the Force India F1 team came on the grid, means the fan club is growing hugely. "And of course 2011, when we host our first race, will be the big moment, by which time I think there will be millions and millions of Indians following F1."